Remember that big green worm with the red horn on its tail that was eating your tomato plants in July? Well, over the last month it has burrowed into the soil, pupated, and emerged as a big moth that shows up after sunset and feeds from flowers at night. The moths are called “hummingbird moths” because they look and act so much like hummingbirds, being able to hover over a flower and drink from it in flight. Also, like hummingbirds, they are fast fliers, zipping back and forth among blossoms. The moth’s tongue is actually longer than its body, allowing it to extract nectar from deep-throated blossoms. These hummingbird moths, which are also called sphinx moths, can have wingspans up to 4 inches. The moths are gray with darker gray and black markings, and they have yellow or orange spots on the sides of their abdomens. The moths’ larvae, those green caterpillars known as hornworms, feed on Solanaceous plants like tomato and tobacco. They have also been found on potato, eggplant and peppers, and they can thrive on these plants’ wild relatives such as jimsonweed, tropical soda apple and horse nettle. Tomato hornworms and tobacco hornworms are similar in appearance and behavior, and both feed on tomato and tobacco plants. The larvae are harmless to humans; the red horn on the rear end is flexible and cannot stick you. The best way to manage the pests is to be vigilant and pick each caterpillar off the plant as soon as you see it. Save it, and you can give it to a local schoolteacher for classroom demonstrations. After the larva has fed to fullness, and is about 3 or 4 inches long, it crawls down into the soil and changes into the pupal stage. The pupa is distinctive in having a loop, almost like a shepherd’s crook, at one end; this is where the mouthparts of the adult moth form. The reddish-brown pupa will remain underground until next spring when the adult moth will emerge from the pupal skin, through the soil and start the cycle all over again. If your garden is already planted when these moths emerge in the spring, they may lay their first batch of eggs on your young tomato plants, so keep an eye out for hungry caterpillars. After 30 years, the Trial Gardens at UGA — that green, flower-laden oasis sandwiched between Snelling Dining Hall and the College of Pharmacy — is being tended by a new green thumb. UGA Department of Horticulture professor John Ruter took over the day-to-day operations from garden co-founder Allan Armitage on July 1. Armitage is officially retiring at the end of 2013. He originally retired in 2010 and came back halftime. 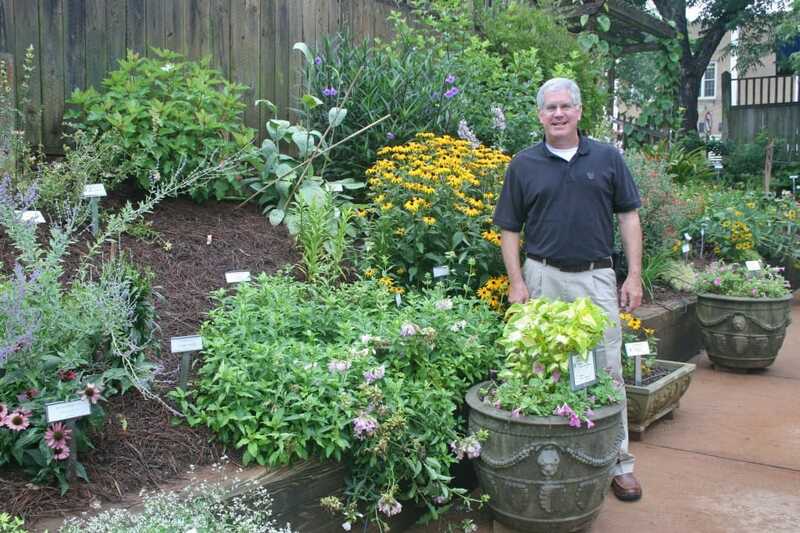 Ruter has spent more than two decades as a horticulture professor and a nursery crop research and Extension specialist on the UGA Tifton campus, where he also ran the Coastal Plain Research Arboretum. He moved to the Athens campus in 2012 after he was awarded the Allan M. Armitage Endowed Professorship for Herbaceous Plant Instruction and Introduction. He now teaches classes in plant identification and environmental issues in horticulture. Ruter doesn’t want to rustle too many leaves as he eases into his new role, but he does want to spruce up the garden a bit — mostly planning changes to attract new visitors, allow it to run more efficiently and be used for more horticulture classes. “I’m just starting with it, but I do have lots of ideas,” Ruter said. While the Trial Gardens serves as a testing ground for new plant varieties, it’s also an integral part of the UGA Department of Horticulture’s teaching and research programs. It’s important to Ruter to maintain all the facets of the garden’s mandate. Plant nurseries and breeding companies send hundreds of new plants each year to see if they can survive the hot and rainfall variable Southeast. They fund the garden by paying to have their plants evaluated by an outside source. That money pays for the gardens’ upkeep and a team of student workers who keep the garden running. While providing an important link with the green industry, the garden is also a research lab, where Ruter will work with graduate students to develop new plant varieties, and a classroom for plant identification and other horticulture courses. Ruter plans to make the garden more useful as a teaching tool by planting more perennials and annuals that bloom in fall and early spring when classes are in session. This will also be good for the entomology, plant biology, plant pathology, landscape architecture and visual arts instructors who also use the garden as an outdoor classroom. Planting for a more diverse blooming schedule will also bolster the garden’s reputation as a destination — both for visitors to the Classic City and for Athens’ residents. Support on-campus and from the general public will be integral to maintaining it as green space on campus for decades to come, Ruter said. Like in every other part of the university, Ruter, Meg Green (Trial Garden supervisor), and her team of student workers and volunteers are operating within tighter budget constraints. The garden will remain open to the public on a daily basis and continue its schedule of public and industry open houses throughout the year. Those seeking more information about the garden can visit ugatrial.hort.uga.edu. During the last state legislative session, a house bill was passed that required all state agencies that issue licenses to verify the legal residence of the applicant. All state agencies had to comply. The following explains the process required for verifying your legal residency when applying for a pesticide license renewal with the Georgia Department of Agriculture. • Go to the documents column on the right side of the page. • Click on the Affidavit link at the bottom of the column. • Complete the form and have it notarized. Include a copy of the applicant’s ID. • Mail, fax, or e-mail the form to the Licensing Division. This document must accompany all new private and commercial pesticide licenses as well as renewals. It is important to understand that you will only have to complete this process once. The Affidavit will be kept on file with the GDA Licensing Program. The website also has a tutorial to lead you through the online license renewal process. Without the Secure and Verifiable Affidavit, new licenses and license renewals cannot be processed. If you have any questions call the Licensing Division (855) 424-4367. If the Department of Agriculture can provide additional information, please let us know. If a business offers mosquito control services for a fee, then they will need at least one person to have a Category 41 (mosquito control) license. Other license categories (24 – Ornamentals & Turf, 21 – General Agriculture, etc.) are not sufficient for companies that offer mosquito control services. Info on the GA Dept of Ag pesticide division. Online video helps prepare applicators to take the mosquito control applicators exam. Where can I order training manuals to study to take the commercial pesticide applicator exam (mosquito control, ornamentals and turf, etc.)? If you do not already have a commercial license, you will need to take two exams – the General Standards exam and the exam specific for your field (Mosquito Control, Ornamentals & Turf, Right of Way, etc.) Find information on ordering the manuals for the general standards exam and the category exams here. How can I register to take a commercial pesticide applicator exam? Visit the Applicator Testing website. You will need to create an account to enter the system. The exams are given at Technical Colleges across the state. I have a license in one category from the Pesticide Division and want a license in a second category. Do I have to take the General Standards exam again? No, you just need to take the test for that exam. Order the manual for that category, study the manual and then register for and take the exam that is specific for that category. Where can I find pesticide applicator recertification classes? Visit this website. Also contact your local Extension Agent for classes. Where can I find information on my commercial applicator’s license (hours needed, etc), recertification classes available, etc.? For regulatory questions continue to contact the respective division. Sandy Shell is one of the Licensing Coordinators for the Georgia Department of Agriculture. She recommends the Kelly Solutions website. Does Georgia have reciprocal pesticide applicator license agreements with other states? Georgia does reciprocate with other states on certain categories. Anyone needing more information on this can call Ag Inputs – Pesticide Section at (404) 656-4958. Gray leaf spot is a fungus disease that affects St. Augustinegrass, perennial ryegrass and tall fescue in Georgia. Hot humid summer weather and high nitrogen levels can make turf susceptible to this disease. 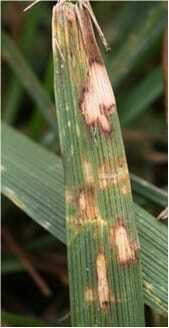 The fungus causing the disease is Pyricularia grisea. Flowers are pink to purple and present in the leaf axils. Other lespedeza species may also be found as weeds in turf but common lespedeza is the primary species in Georgia. To see the entire publication click here. Photo credit – Common lespedeza in a centipedegrass lawn. Photo by P. McCullough. It is time to scout for Brown patch (caused by Rhizoctonia solani) and Pythium blight (caused by Pythium spp). 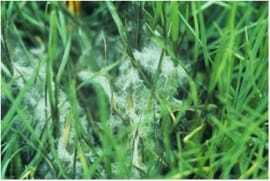 These diseases are often the most serious diseases on cool season grasses, especially on tall fescue and ryegrass. Brown patch can cause a foliar blight, which results in necrotic leaves and circular brown patches up to 4-5 ft. in diameter. High soil and leaf canopy humidity, and high temperatures increase disease severity. Higher than recommended rates of nitrogen in the spring promotes disease. Pythium blight has the potential to quickly cause significant damage to turfgrass. The disease starts as small spots, which initially appear dark and water-soaked. Affected turfgrass dies rapidly, collapses, and appears oily and matted. White, cottony mycelia may be evident early in the morning. The disease is driven by hot-wet weather, which correlates with an increased stress on the turf. Similar environmental and cultural factors that encourage brown patch also promote Pythium. Therefore, cultural practices for control of brown patch will also help to minimize Pythium blight development. A correct diagnosis is important because Pythium control requires specific fungicides. Several fungicides are available for each of the diseases described above. Consult the Georgia Pest Management Handbook or the Turfgrass Pest Control Recommendations for Professionals for proper fungicide selection and usage. Read the label and follow proper guidelines. Armitage’s Herbaceous Perennials for the Sun is a self-paced, self-study online certificate program authored by the Dr. Allan Armitage, one of the world’s leading experts on and researchers of perennials. In this professional development course, you’ll learn the characteristics, propagation methods and optimal growing conditions of 20 species of sun perennials. The course is online, so you can progress at your own pace, on your own schedule. The course centers on Dr. Armitage’s textbook, Herbaceous Perennial Plants: A Treatise on their Identification, Culture, and Garden Attributes. Other resources include online access to the professor’s audio clips describing each plant’s history, propagation, flower structure, identifying characteristics, and pros and cons. You’ll assess your knowledge through self-tests, interactive exercises, and end-of-lesson quizzes that provide instant feedback. This is a self-paced, self-study course. The course is authored by Dr. Allan Armitage. He is well known and highly acclaimed as a writer, speaker and researcher. He is recognized as a leader in introducing outstanding plant varieties to the industry. Before retiring from the University of Georgia, he ran the research gardens where new plant material from most of the flower breeders in the world is evaluated. The Trial Gardens at UGA are among the finest trial gardens in the nation. They are open to the public throughout the year. Prerequisite Courses: There are no prerequisites. Suggested Textbook: Armitage, Allan M. Armitage’s Garden Perennials: A Color Encyclopedia. Timber Press. 2000. (ISBN 0881924350). This textbook is not required but will be an excellent resource for your personal library. Textbooks will be shipped independently of your online course access details, so you should allow extra time for their delivery. Throughout the online course you will encounter many images, maps, links to external websites, animated exercises, and audio/video clips. To take full advantage of all these features, you will need a Windows- or Macintosh-based computer with a browser and a Flash player. A fast Internet connection is highly recommended. View Technical Requirements for more details. Rose rosette virus is a damaging disease that is seeing an increase in occurrence across midwestern and southern states. Rose rosette has been described since the 1940s, but it wasn’t until 2011 that the causal agent was confirmed to be a virus spread by the ‘rose leaf curl’ eriophyid mite (Phyllacoptes fructiphylus). Rose rosette virus was predominantly found in multiflora roses (Rosa multiflora) that now grow wild in many places and is considered an invasive/noxious weed. The wild multiflora roses were thought to be how the mite and virus spread into rose landscape plantings. What is causing greater concern is that the virus is now being seen in Knock-Out roses (see images). Knock-Out roses cover commercial and residential landscapes throughout the south because they are more disease resistance than other hybrid roses. The presence of the mass Knock-Out plantings provides an easy means for the mite and virus to spread from plant to plant and location to location. 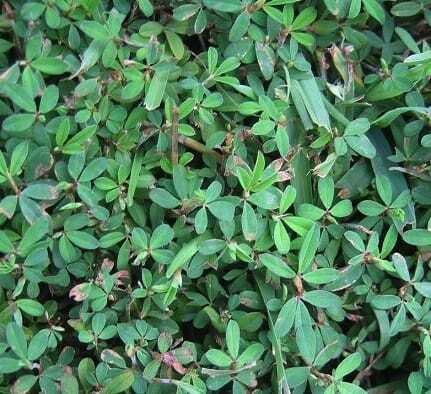 The increase in the amount of rose rosette showing up in Knock-Outs, which are all vegetatively propagated, has led to speculation that the virus may be spreading through nursery stock as well. This is possible, but currently I don’t have any evidence of this. 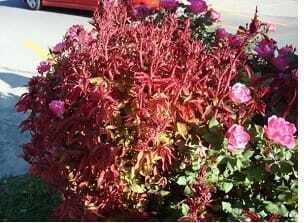 Symptoms of rose rosette virus mimic herbicide injury. In the past, we had no way of confirming the pathogen’s presence and often tried to rule out improper herbicide use. Symptoms include an increased and rapid elongation of new growth; abnormal reddish discoloration of shoots and foliage (see image above); witches broom (proliferation of new shoots); an overabundance of thorns; and deformed buds and flowers. We are testing a molecular PCR test in the Athens clinic that can detect the virus RNA in order to confirm the disease. This test is the only way we can confirm virus infection. If rose rosette virus is confirmed or suspected, control options are few. There is no cure for rose rosette. Roses growing near infected cultivated or wild (multiflora) roses have a high risk of infection. Inspect new nursery stock for symptoms of infection. Remove all multiflora roses from the area and increase plant spacing so rose plants will not touch each other to reduce mite spread. If rose rosette is present, completely remove the infected plant by bagging and discarding or by burning. There is some discussion on online garden forums and from rose breeders that just pruning off symptomatic canes/stems will remove the virus. There is not at present any scientific evidence that this will work. Therefore, the prudent recommendation I can give is to completely remove the infected plant. A miticide can help reduce mite (and virus) spread; however, miticides labeled for spider mite control and those commonly packaged for homeowners are ineffective on eriophyid mites. If homeowners want to have their roses sprayed, then they should contact commercially licensed landscape professionals who can use (per communication with entomologist Will Hudson) Avid (or other abamectin generics), Floramite, Magus, and Forbid.